A U.S. agreement to assist North Korea with food has been suspended following the North’s failed rocket launch, a government spokesman said Friday. “We are not going forward with an agreement to provide them with any assistance,” Ben Rhodes, deputy national security adviser, said at a briefing for reporters with President Obama in Florida. Rhodes said there will be more sanctions if North Korea carries out more “provocative actions,” NBC News reported. A U.S. official told NBC North Korea might change policy after four failures to launch a long-range rocket, especially given the death of Kim Jong Il in December. “Think about it: This is the fourth failure to launch this missile as it was designed and should serve as a real wake-up call for the new government,” the official said. Rep. Jon Kyl, R-Ariz., the Republican whip in the House criticized the Obama administration’s policy toward North Korea as naive and said the United States should instead focus on missile defenses. Kyl said North Korean engineers and scientists could learn even from a failed launch. The White House strongly condemned the launch. “North Korea is only further isolating itself by engaging in provocative acts, and is wasting its money on weapons and propaganda displays while the North Korean people go hungry,” White House spokesman Jay Carney said in a statement after the multi-stage rocket disintegrated some 80 seconds into flight and parts crashed in the Yellow Sea off South Korea. South Korean Foreign Minister Kim Sung-Han said the launch was “a clear breach of the U.N. resolution that prohibits any launch using ballistic missile technology. “It is a provocative act threatening peace and security on the Korean peninsula and Northeast Asia,” he said. South Korean President Lee Myung-bak convened an emergency security meeting, and his office said Seoul would continue to closely monitor its neighbor’s actions. The statement was the first time the North publicly acknowledged a long-range missile or satellite failure. The Una-3 rocket took off at 7:39 a.m. local time (6:30 p.m. EDT Thursday) from a new launch facility in the country’s northwest corner near China, North Korean state-run media said, and flew south toward Japan’s Ryukyu Islands, the Philippines, Indonesia and Australia. 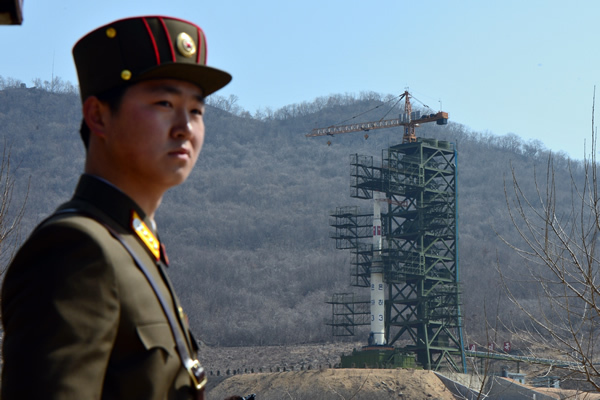 It apparently exploded at roughly the time its first stage should have burned out and second stage kicked in, U.S. and South Korean defense officials said. South Korea, Japan and the Philippines — the countries near the North Korean rocket’s projected trajectory — were on heightened alert in case the launching went awry. North Korea had trumpeted the launch as a showcase of patriotic pride on the 100th anniversary of the birthday of the country’s founder, Kim IL Sung, grandfather of the new leader, Kim Jung Un. North Korea elevated the grandson to the highest levels of state power Wednesday. A group of foreign journalists invited to view the rocket on its launchpad earlier this week were not permitted to watch the launch, even remotely.